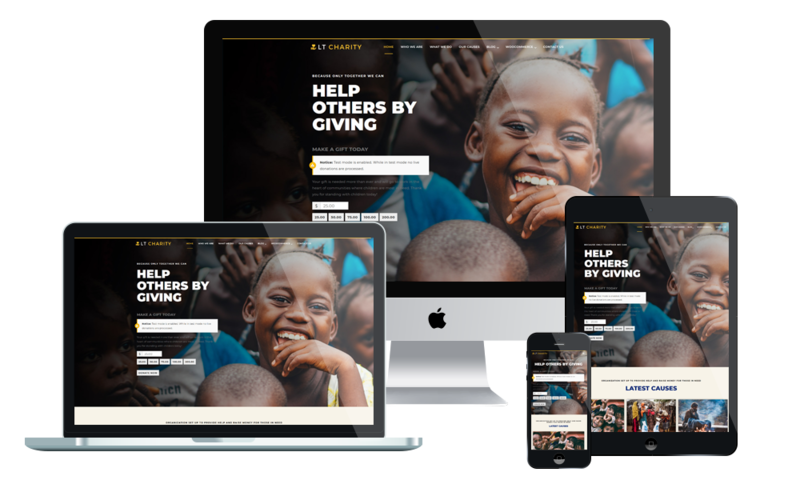 LT Charity is a free and premium WordPress theme well-suited for non-profit websites. This is meaningful theme designed for all types of online charity projects which are doing something useful, helpful and constructive. Give a helping hand to those who need it with this theme. LT Charity is 100% responsive that automatically adapts to any possible screen resolution of all mobile devices, displaying all the content in the best way. It comes with unlimited color and a color picker in the admin panel. Moreover, we offer support services like Bootstrap CSS & Hybrid framework, strong shortcode and drag-drop layout content… ready to help clients develop their websites. Responsive Charity WordPress theme dramatically increase donations, promote key messages and make lives better for children. Present the mission and the help to the homeless children. In addition, describe the work of some charity organizations that you have been doing. Introduce to people Workplace Giving page with images describing detailed information about charity and voluntary work. Showcase all the project of charitable non-profit organization that you are involved for all to refer to this page based on our website. The image of the charity program which your organization has participated will be displayed in an eye-catching way on this page.